Michael Colla and Rachel Quinn are two of six teacher education candidates who travelled throughout Nepal’s Kathmandu Valley to lead professional development sessions as part of Education and Leadership Institute (ELI). ELI is a professional learning initiative developed by Laurier education professor Steve Sider to build teaching and leadership capacity among educators in developing countries. Led by Laurier education professors Judy Halpern and Bruce Alexander, and local teacher Rob Spackman, the group focused on developing Nepali educators’ competencies in the “four Cs” of 21st-century skills. The interrelated skills of collaboration, communication, creativity and critical thinking are tools that students will need for life and work in the future. While they seem like obvious skills to teach, how to teach them in the Nepali education system is not as clear. Nepal’s Ministry of Education requires students to pass a standardized examination at the end of each school year. Because of this, most teachers teach to the test and rely on rote learning exercises for student instruction. But recently, the ministry mandated teachers to assign students a grade for practical or applied knowledge – something they had never before been asked to do. For Colla, music is a perfect medium for teaching and learning the four Cs. He developed a high-impact workshop where the only required resources were a voice and an imagination. The vocal music graduate led participants through North American pieces – the Mi'kmaq Honour Song, which incorporates Indigenous chants and nature soundscapes, and Wade in the Water, a pop culture classic often associated with the American civil rights movement of the 1960s. Singing gave Colla’s participants the opportunity to practice speaking English, a desired skill in Nepal’s mountain and village communities. It also led to dancing, which is something the Laurier student says his group couldn’t help but do during his workshop. Quinn led a mapping workshop for her group of Nepali educators focused on identifying sustainable practices in the school community. They collaborated to create a scaled map of the village, which generated conversation about community practices that could help or hinder the local environment and related ecosystems. It was an exercise that only required paper, pencils and a shift in perspective. Quinn says one Nepali teacher she met collaborated with the school to organize a clean-up of the river that ran behind his school’s property. The teacher also showed students how to transform empty plastic beverage bottles into flower pots that hung from the school’s roof. Despite the lack of subject-specific resources, Quinn says her experiences in Nepal’s rural schools taught her an important lesson. Quinn says one school the group worked at experienced extensive flooding in their classroom due to heavy rain. The Nepali teachers and students rose to the occasion, adjusting to the situation and moving forward with the school day. “Their resilience and desire to learn is really inspiring to me,” says Quinn. Workshops led by other Laurier teacher education candidates focused on computer coding with everyday objects, cooperative games and inclusion, identifying geometrical shapes in the environment, and using role play to teach the human digestive system. Halpern, Alexander and Spackman plan to lead a new team of teacher education candidates to Nepal in 2019 to build on the success of ELI’s spring workshops. They also hope to explore a possible memorandum of understanding with the Faculty of Education at Kathmandu University to incorporate elements of ELI into Nepal’s teacher accreditation process. 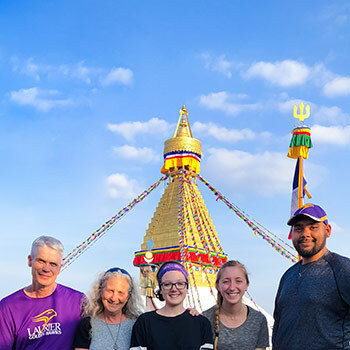 Although their classrooms sit thousand of kilometres apart, Halpern says her Laurier team and their Nepali contacts have one thing in common. “We all want what is best for our students,” she says. Bachelor of Education students interested in participating in ELI Nepal can contact Professors Alexander or Halpern. To learn about ELI in Haiti, contact Professor Steve Sider.